Unfiltered, Unpasteurized & Bottle Conditioned. 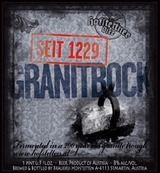 Granit Bock is brewed according to the historic style "Stone Beer" (Stein Bier). Stone beer is a unique style that comes from the Baden-Wurttenberg & Franconia regions of Germany and the Kaerten region in Austria, it dates back to the Middle Ages. The Granit Bock is brewed in large granite open troughs. The granite stones are then heated to be white hot and added to the wort. This causes the sugars in the malt to caramelize around the stones and gives the beer lovely caramel and roasted flavors. It also gives the Granit Bock a unique smoked flavor. Yeast is added about 1 hour after the white hot rocks have been added to the wort., allowing for an open fermentation. The Granite Bock is then matured for several months on the cool cellars under the brewery.